After Governor Cuomo’s 2013-2014 Executive Budget proposed to redistribute school aid away from Long Island schools and redirect the funding to other districts, members of the Long Island Assembly Minority Delegation has taken a stand. The delegation has launched a petition urging Governor Cuomo to give Long Island students their fair share of school aid, as well as a You Tube video at to appeal for their school districts. 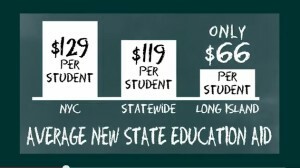 Under the governor’s current proposal, Long Island students would receive an average of $66 in new funding per student, far below the statewide average of $119 and the New York City average of $129 per student. “The governor’s proposal to redistribute millions of dollars away from our children, Long Island’s future, is not only irresponsible but will have far-reaching effects for years to come. As an educator and former South Huntington School Board member, I know the impact a quality education has on a child’s life. Long Island residents already pay some of the highest taxes in the nation and our children deserve their fair share of school aid. I hope you will join me in voicing your support for the future of Long Island by signing our petition,” said Assemblyman Chad Lupinacci (R,C,WF,I- Huntington Station). “The school children of Nassau County deserve the same opportunities and funds as school children in other parts of New York State. The Governor’s proposed cuts to school funding is flawed and discriminates against our kids for living on Long Island. It’s ludicrous to think that the working families and seniors of the 21st District should pick up the expense for the accelerating cost of education statewide, while other regions are seeing proposed increases in their state school aid. It is time to stand up and fight for the kids of Nassau County,” said Assemblyman Brian Curran (Lynbrook, 21st AD). “Homeowners on Long Island are constantly feeling the onerous burden of rising property taxes. The governor’s proposed 2013-2014 Executive Budget would prevent our local schools and children from receiving the state education aid they need and deserve. It is my hope that we, on Long Island, can stand up to this injustice and show the governor his mistake by signing this crucial petition,” said Assemblyman Michael Fitzpatrick (R,C,I-Smithtown). “Long Island homeowners are the highest-taxed in the state. The governor’s proposal redistributes our tax dollars away from our schools and our students and gives it to districts deemed more important. I urge my residents to sign our online petition and let the governor know that our children deserve their fair share of school aid,” said Assemblyman Michael A. Montesano (R,I,C-Glen Head). “This new redistribution of aid promotes children across the state at the expense of Long Island children and homeowners. By signing this petition, we can send a message that our children deserve the same amount of aid as those across the state,” said Assemblyman Edward P. Ra (19th Assembly District). “Long Island represents 17 percent of the school-age children in our state. Therefore, we deserve our fair share by receiving 17 percent of all education funding in the budget. Anything less would be discrimination. The legislature must provide real mandate relief for our schools. This is required to strike a balance of commitment to quality education of protection of our property taxpayers,” said Assemblyman Joseph Saladino.